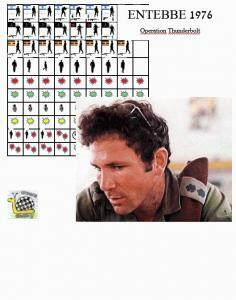 Entebbe 1976 is a solitaire war game depicting the action performed by Sayeret Matkal, one of the Israeli Special Forces, in the airport of Entebbe, Uganda, where a group of terrorists, who had hijacked an Air France Boing, were keeping as prisoners the crew and the Jewish passengers. A daring operation, far from the home bases 4000 kilometres and 8 flight hours, which was a success with the liberation of the hostages and the elimination of the terrorists, with the loss of just one officer and few hostages but some wounded soldiers. 86 gorgeous counters, a nice A3 map, updated rules... you just need 2 d6! !